You know that feeling when you get to meet someone you’ve admired for years? Pink and her six-year-old daughter have perfectly captured it, making Willow’s pop princess dreams come true in the process. Grammy nominee and all-round superstar mum Pink performed her new song Wild Hearts Can’t Be Broken yesterday, in front of her peers. While she didn’t scoop up a Grammy, she did manage to level-up in the “best mum in the world” stakes as events unfolded – and that might be even better. Let’s pause to note that taking your kids to the Grammys is actually the new black, with not just Pink, but also Beyonce and Jay-Z and DJ Khaled going family style. There are plenty of great reasons for celebrities to have these little sidekicks in tow. Not only does it save famous parents getting a babysitter for what is a marathon event, they can also score some extra hugs, if they manage to snaffle a meet-and-greet with their kiddo’s favourite singer. 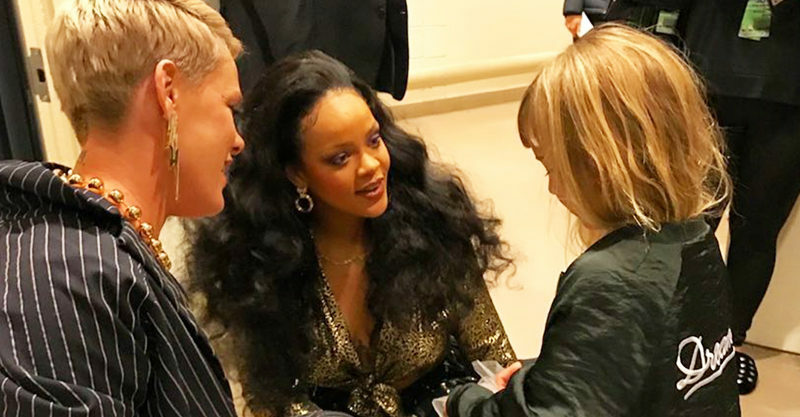 That’s just what happened here, so let’s return to the story, with young Willow absolutely lapping-up the chance to chat to her Grammy idol – Rihanna. “Dreams come true. My daughter lives for this woman. So do I,” Pink captioned a photo of Willow snuggling up to the (other) award-winning singer. I thought for sure mama @pink had the Grammy in the bag tonight, but it didn’t happen. But, she made the night VERY memorable for Willz!!! Willz has been a fan of @badgalriri for a long time, and mama got an intro for her. Major mom points tonight. Pink’s husband, Carey Hart, also posted an image of the dream meeting. It features a crouching Rihanna chatting with the six-year-old – and the look on Rihanna’s face is melting our hearts and we’re basically DEAD. Carey felt pretty strongly about it too, and was thrilled that his little girl got to meet her favourite singer (and a little sad that Pink didn’t nab a trophy). Rihanna also performed at the Grammys, busting out an energetic version of Wild Thoughts as DJ Khaled bleated encouragingly from the sidelines. So great to see two strong and talented women supporting one another and inspiring future generations to live their best all-singing, all-dancing lives.